Traveloscopy Travelblog: Struth! World's longest rail tunnel now open. Struth! World's longest rail tunnel now open. 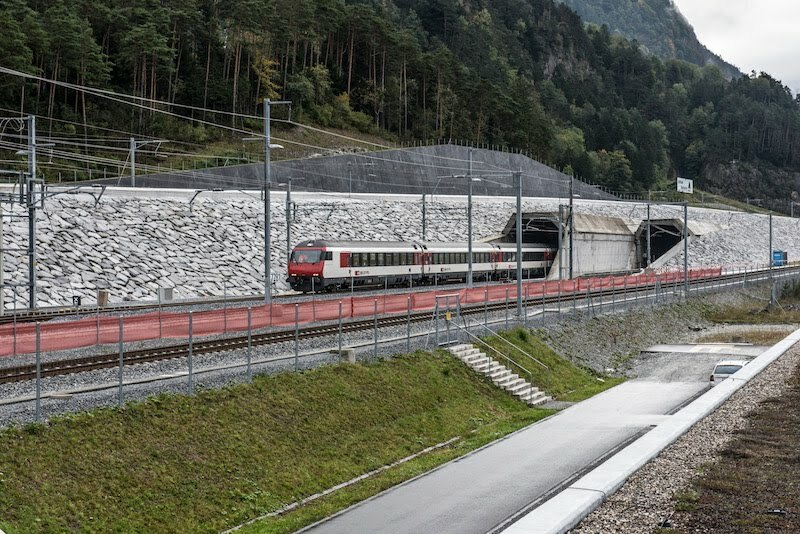 THE world's longest and deepest railway tunnel has officially opened to link Switzerland's north with its south, running an amazing 57km through the Swiss Alps at a depth in places 2.3 kilometres below the tips of the highest mountains above it. Construction of the Gotthard Base Tunnel (GBT), which is actually two parallel single-line tunnels, began in 1999 and took seventeen years to complete at a cost the equivalent of 16.5 billion Australian dollars. And on December 11 it officially went into use with high speed passenger trains flashing through it at speeds of up to an incredible 250kmh on an almost-flat route from Erstfeld in the north to Bodio in the south. And those trains take just 17 minutes to cover the whopping 57km length, with another tunnel to open in 2020 meaning for a reduction then of over an hour in current rail travel time between the major cities of Zurich, Lugano and Milan. But the new GBT is not just a time-saver for rail passengers – Swiss Federal Railways say the tunnel will be used by new freight trains as well, saving an incredible 1-million lorry journeys a year on roads through the Swiss Alps, thus reducing environmental damage enormously. FOOTNOTE: When the Swiss Federal Railways decided to offer 1,000 free tickets on the first official train through the Tunnel last Sunday, they held a lottery to pick the lucky 1,000 travellers – and over 160,000 locals rushed to buy tickets in the lottery in the hope of getting one of those 1,000 seats. TRAINS like this will flash at speeds of up to 250kmh some 2.3km deep in the Swiss Alps with the opening on December 11 of the world's longest and deepest rail tunnel.